Mid 19th century map of Illinois showing lead regions. A New Map of Illinois with its Proposed Canals, Roads & Distances from Place to Place along the Stage & Steam Boat Routes. 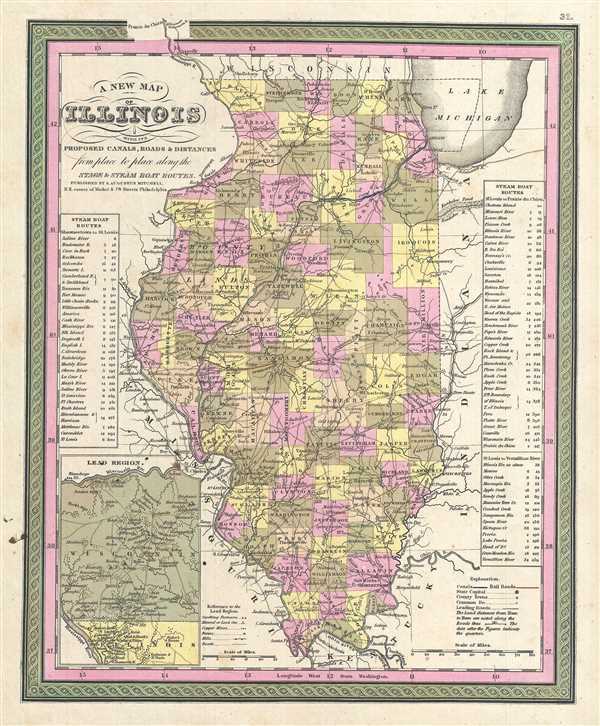 This is an uncommon 1849 map of Illinois by Samuel Augustus Mitchell. It covers the state of Illinois with exceptional detail, noting canals, railroads, steam boat routes, towns, rivers, roads and other topographical features. Steam boat routes are listed along the left and right border. The bottom left includes an inset featuring the lead regions in north west Illinois as well as Wisconsin. Inset features Galena and vicinity and notes smelting furnaces, mineral and lead ore, copper mines, farms, mills and roads. The whole is engraved and colored in Mitchell's distinctive style with green border work and vivid pastels. Mitchell published this chart in his atlas from 1846 to the late 1850s before discontinuing the series and selling his map plates to DeSilver. This map was issued in the 1849 edition of the New Universal Atlas. It was the last edition of that atlas to be published by Mitchell prior to selling the plates and rights to the atlas to Thomas Cowperthwait in 1850.